This dish is easy, vegan, and adaptable, but packed full of flavor. The only tricky thing to find is the harissa, a North African chili paste, but I actually didn’t have any trouble–check an ethnic grocery or there are also recipes online to make your own. Warning: the recipe as posted is pretty spicy! 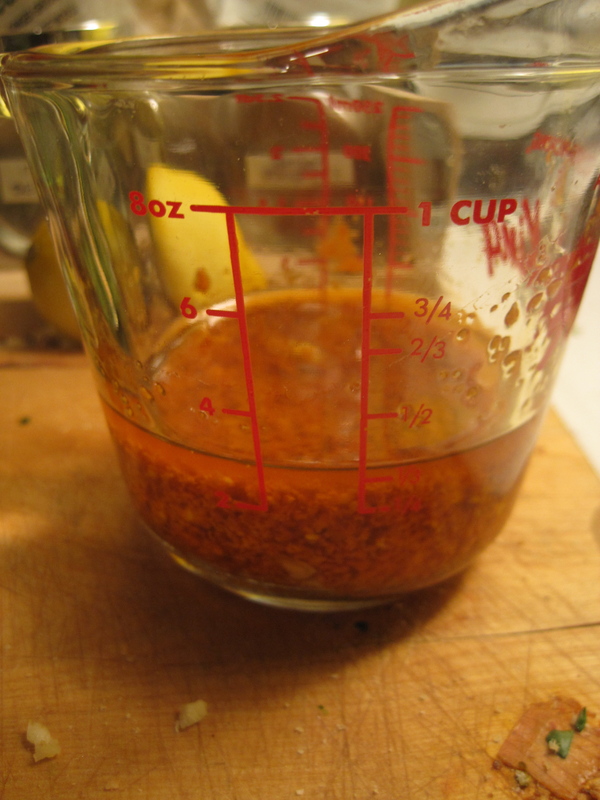 Try a greater ratio of tomato paste to harissa and taste your sauce as you go if you prefer something milder. Update: I’ve also done quick variations of this pasta when in need of a quick lunch to bring to work, and I can confidently say that you should experiment away with it. As long as you have the basic oil/garlic/tomato paste/harissa/lemon sauce, you can sub in other veggies (sauteed mushrooms are great, I bet zucchini would be awesome too) and flavorings. Crumbled feta is just perfect in here, I left it out of the main recipe in the interest of maintaining the veganness of the dish but it’s definitely recommended if you have it around! Start a pot of water to boil for the pasta. Assemble your ingredients! Mince the garlic as finely as possible and mix it with the salt. Whisk together the garlic-salt mixture with the olive oil, harissa, and tomato paste. Salt the pasta pot and add the noodles, cooking as directed. Just before the pasta is done add the spinach to the water, count to six, drain, and set aside. 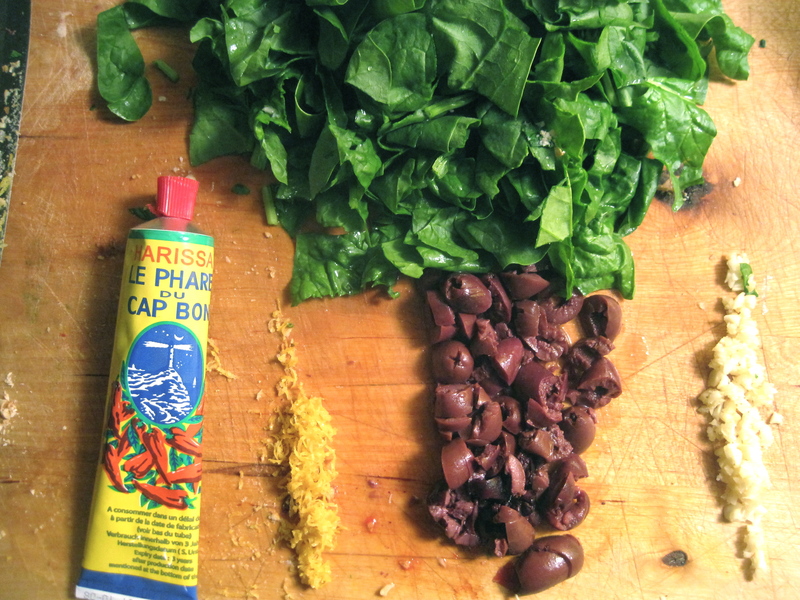 Heat half the harissa oil in the empty pasta pot, add the pasta, spinach, olives, nuts, and lemon. 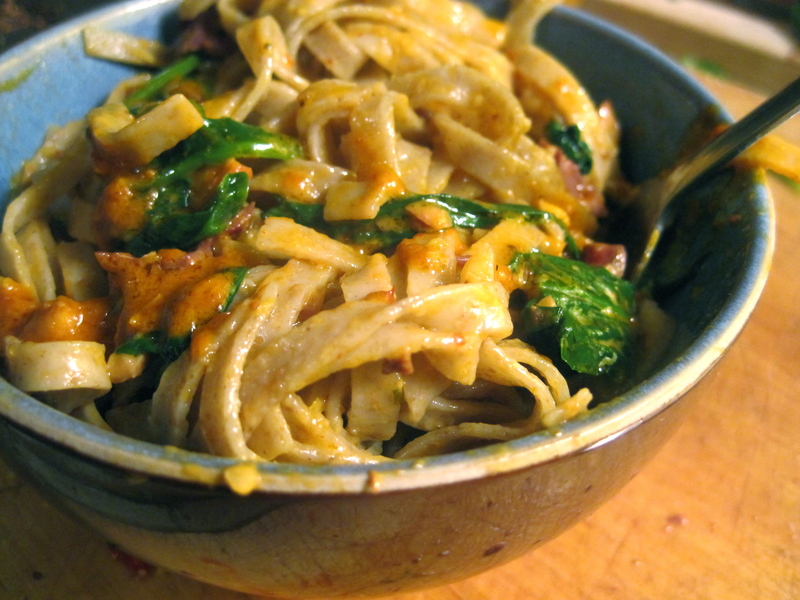 Mix together for a few minutes, then serve the pasta drizzled with the rest of the harissa oil.